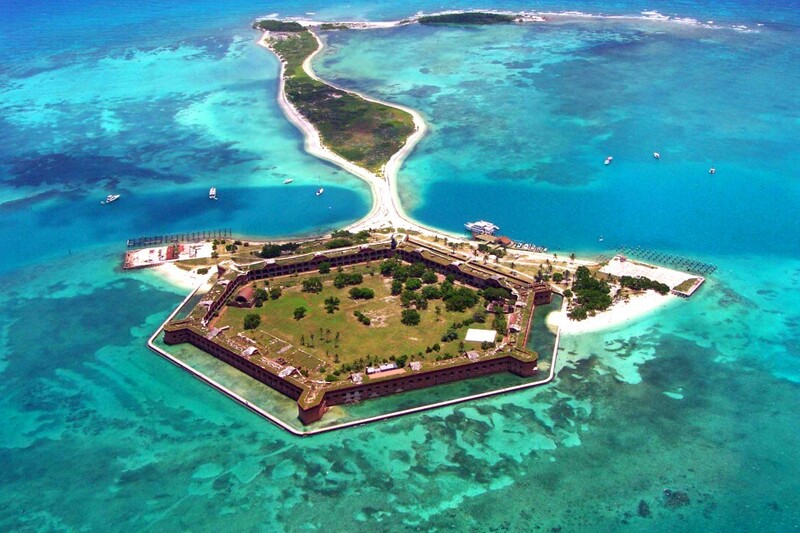 70 nautical miles off the coast of Key West in Florida is a series of seven islands set among a graveyard of over 200 ships, crowned with a massive 19th century fortress that lay abandoned for nearly a century. 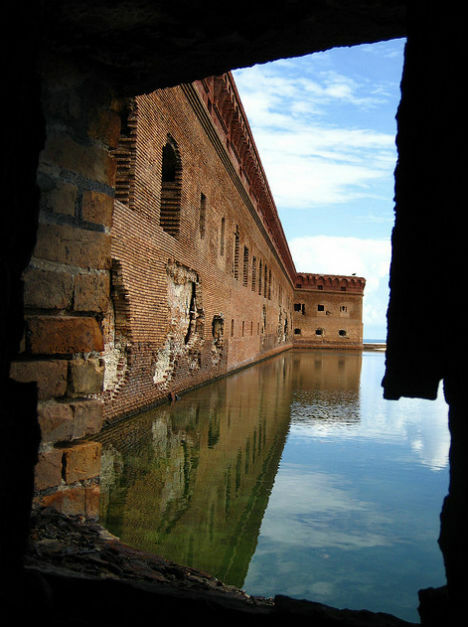 The Dry Tortugas once hosted Spanish explorer Ponce de Leon and an influx of marauding pirates; today it’s a bird and wildlife sanctuary and a national park. 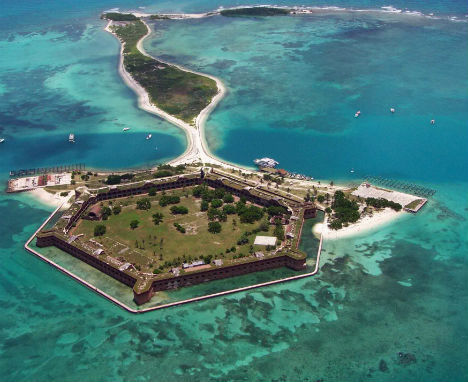 In 1513, Ponce de Leon became the first European to discover the island, naming it ‘Tortugas’ for the many green, hawksbill, leatherback and loggerhead turtles he found there. He and many pirates after him relied on the turtles for meat and eggs. Between the 1600s and the 1800s, hundreds of ships wrecked on the surrounding reefs and shoals, and word ‘Dry’ was added to the islands’ name on maps to warn mariners of the lack of fresh water. 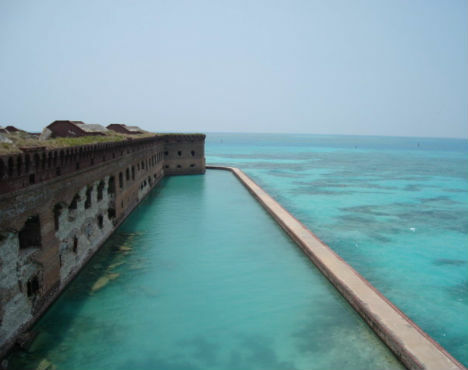 Construction began on the 45-foot-high, hexagonal Fort Jefferson on Garden Key in the late 1840s when U.S. Army strategists became concerned about the security of shipping lanes in the Gulf of Mexico, and it was still unfinished 30 years later. 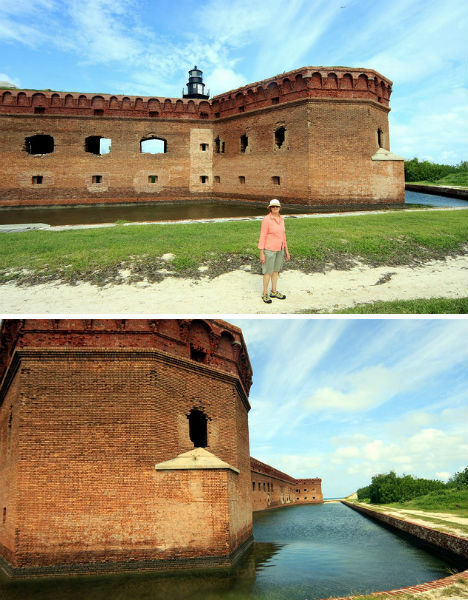 It was briefly used as a prison for Union deserters in the Civil War, but was besieged in later decades by yellow fever, hurricane damage and the fact that its cannons had become obsolete. It was permanently abandoned in 1907. 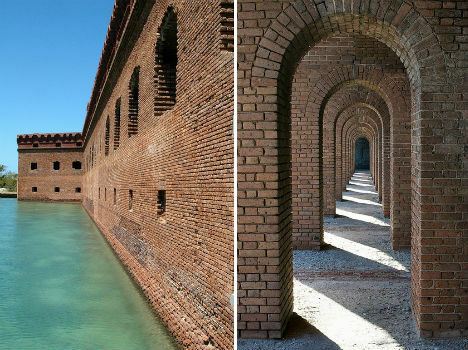 Fort Jefferson and the rest of the 64,700-acre Dry Tortugas were officially established as a national park in 1992. 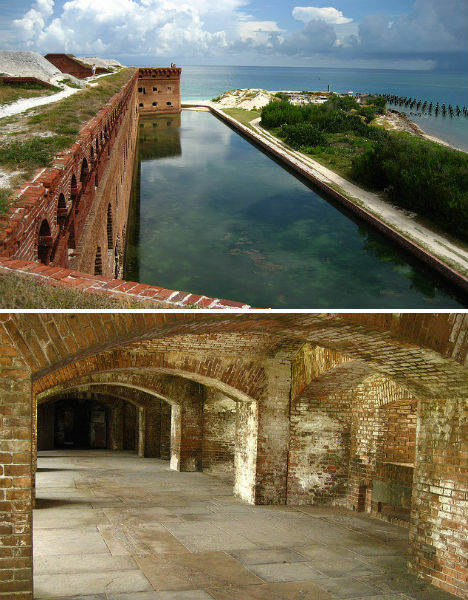 Fort Jefferson remains the largest all-masonry fort in the United States. While restoration efforts have helped preserve it, the forces of nature and time continue to take their toll. 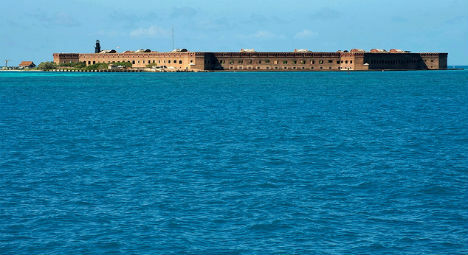 The islands can be accessed by a three-hour boat ride from Key West, or a 45-minute plane ride.